This original ticket stub dates from August 9, 1946. The Yankees played the Red Sox at Yankee Stadium and lost 4-3. Highlights from the game inclue Rudy York’s 14th Home Run of the season in the 6th inning to give the W to the Sox (on their way to their American League Pennant and Ted Williams’ only World Series) after Dom DiMaggio hit a 2 out Triple and a walk by Ted Williams. Dave “Boo” Ferris would get the win for his 19th win of the season (he was 19-4 for the season). Aaron Robinson drove in all the New York Runs with a home run and double (Joe DiMaggio was on base). Bill Bevens took the L. It was a great day for Ted Williams as he went hitless. Nonetheless, this was another legendary matchup of the two best players of the 1940’s Joe DiMaggio vs Ted Williams. 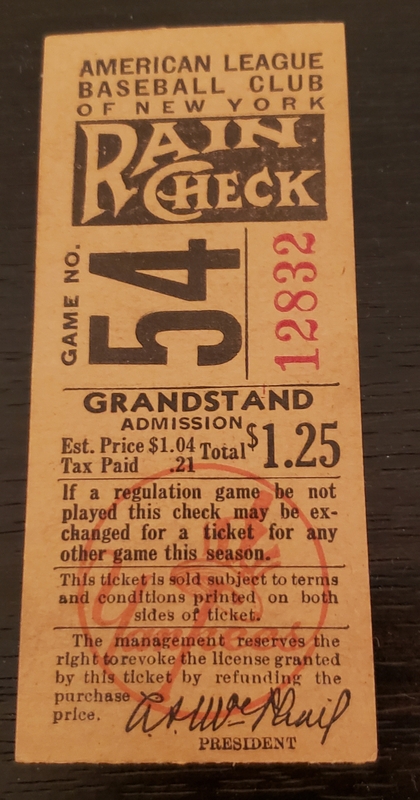 RARE ticket purchased out of an 80 year collection from a gentleman in his 90’s.